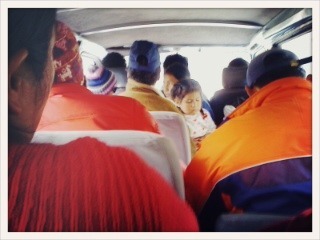 Taking a Combi is one of those experiences every “Gringo”, aka foreign/white person, should experience here in Peru. Combi (hoping that I’m spelling it correctly) is a mini bus, containing mostly of commuting locals, children, farmers, crying babies, some brave tourists, chickens, guinea pigs, bikes and pretty much anything else you can think of. The most interesting part about the Combi is: One, you’ll hear the most random 90s and 80s music blasting from the buzzing car speakers as if Ollanta has been captured in some kind of musical time capsule, and second, the very apparent cultural gap between us and the Ollanta citizens. The initial thing that comes to mind when riding on a Combi, is of course, the lack of personal space. Where as in most English speaking countries such as the U.S. and England, it is important to give one room to breath, that is not usually the case in developing municipalities such as Ollanta. It is quite normal to have an old man almost sitting on your lap. If there is room to breath, there is room for more passengers. No Problemo. After your initial shock, the second thing you will probably notice is how interesting and culturally rich the people surrounding you are. The westernized music might fool you at first, but you notice that the elderly are always respected, the children are well behaved, and even though they might be sitting arm in arm, an estranged man would never glance at the woman openly feeding her baby. The best part of it all is how quickly you become accustomed to these cultural diversities. Before you know, you are comfortably sitting way too close to a Quechua woman who smells of wonderful spices and baked goods, goggling at a cute baby, and laughing with the locals. You realize that you too have become a part of it all.